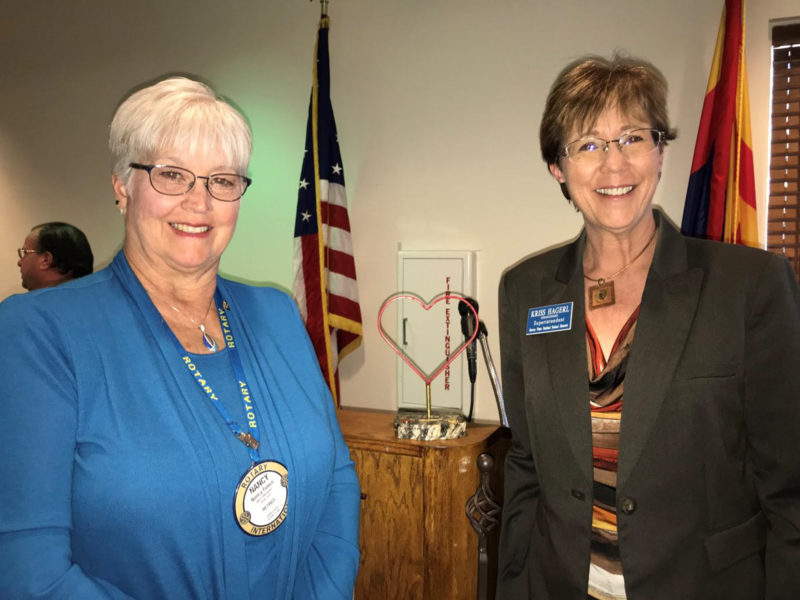 Our guest speaker last week was Fellow Rotarian (Sunrise Club), Ms. Kriss Hagerl - Sierra Vista Unified School District Superintendent. Ms. Hagerl Pro-vided us a "Capital Bond Update" and history about the School District. In 1915, "Buena" school was opened then came the "Carmichael" school in 1956. It was a K-12 school at the time. The most recently built school in the district is Buena HS, but Bella Vista was demolished and rebuilt in 2003. State Budget cuts from 2008 to 2016 created severe need for additional school funding. In 2016, a 23 member committee proposed a bond measure to raise $28.8 million. The bond measure passed with 55 percent of the votes cast. The capital bond projects include paying for delayed maintenance, remodels and renovations, roofing, new construction, technology and transportation. Security doors and vestibules have been installed at various schools, security fencing has been installed at several elementary schools, several roofing pro-jects are ongoing or have been accomplished and ADA access have been completed. The library at JCMS has been remodeled. Drinking fountains throughout the District are being replaced. Ten new 84 passenger buses, four 14 passenger mini-buses and five special needs buses have been added to the fleet. More than $6mil of the bond will be allocated to technology in the district, the majority of which is being used for classroom training and instruction. Buena HS and JCMS have received the upgraded tech and the elementary schools will be next. JTED funds will also be used to build a culinary arts facility at Buena. It will include a commercial kitchen, classroom and cafe. Continued challenges include legislative cuts, maintenance and operations budget reductions, teacher shortages and the uncertain renewal of Prop 301 (sales tax for education). A huge thank you to Kriss Hagerl for being our guest speaker and for all that she and her staff do for our children in Sierra Vista. Les Orchekowsky was selected as the Rotarian of the Month for his efforts in organizing and carrying out of the Forgach House service project. Our Christmas Party will be held on December 12th, at the Pueblo Del Sol Country Club. We ask that you please bring an unwrapped toy for Toys for Tots.